Glaucoma is an eye condition that develops when too much fluid pressure builds up inside of the eye. It tends to be inherited and may not show up until later in life. The increased pressure, called intraocular pressure, can damage the optic nerve, which transmits images to the brain. 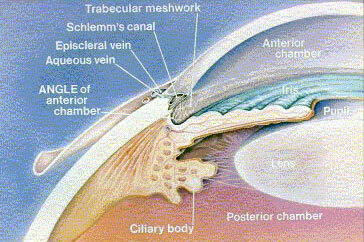 If damage to the optic nerve from high eye pressure continues, glaucoma will cause loss of vision. Without treatment, glaucoma can cause total permanent blindness within a few years. If you are over the age of 40 and if you have a family history of glaucoma, you should have a complete eye exam with an ophthalmologist every one to two years. If you have health problems such as diabetes or a family history of glaucoma or are at risk for other eye diseases, you may need to visit your eye doctormore frequently. 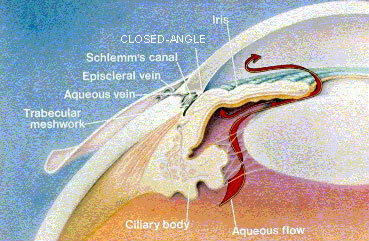 Glaucoma usually occurs when intraocular pressure increases. This happens when the fluid pressure in the eye's anterior chamber, the area between the cornea and the iris, rises. Less common causes of glaucoma include a blunt or chemical injury to the eye, severe eye infection, blockage of blood vessels in the eye, inflammatory conditions of the eye, and occasionally eye surgery to correct another condition. Glaucoma usually occurs in both eyes, but it may involve each eye to a different extent.What Are the Types of Glaucoma?